Lately I find myself having an allergic reaction when I hear people speaking or read articles about wanting to have balance in their lives. Much of it, based on what I’ve read, is about aspiring for balance as a fixed state; with things having the proper amount of importance or attention. The International Film Festival Rotterdam wrapped up last week and luckily I managed to catch a great film about a married couple who have had a big impact on some of the most iconic Hollywood films (The Birds, The Ten Commandments, The Graduate, Fiddler on the Roof, Scarface, and the list goes on…). Unless you work in the industry, you’re likely to never have heard of Harold & Lilian Michelson, but when Spielberg, Katzenberg and Geffen started Dreamworks guess who they called? Last year, in honour of International Women’s Day, I named 5 awesome women; women who I appreciate, admire, have learned from and who I personally know. Here are my 5 for 2015. The last week I’ve been participating in New Tech City‘s bored and brilliant project. I decided to participate because I intuitively agreed with the premise; connectedness can be great, but having my mind overstimulated can hinder my creativity and leave me feeling drained. How do you react when you hear/read something that you perceive as negative/critical about your country/culture? Sad? Angry? Uncomfortable? Would you react differently if you heard it from someone who comes from a different country/culture than your own? In honour of International Women’s Day, Juan asked me to name 5 awesome women; women who I appreciate, admire, have learned from and who I personally know. Well as it turns out I know a lot of them – definitely more than 5! Nevertheless, I have come up with my 5 awesome women (and hope to continue each year to come!). Over Thanksgiving weekend in 2008 my maternal grandfather passed away. Even though I knew his time would come, I don’t think that made it any less painful. I luckily got to see him before his health started seriously declining. Action – Achievement = ?? It triggered an interesting conversation with Juan. I interpreted this picture as making a statement for people who talk about their complaints or talk about things they wish they would do and never take action to make it happen. But is action the answer? 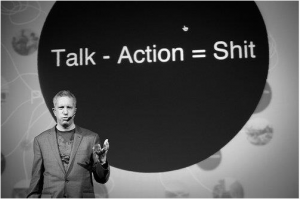 Action of course matters, but can become quickly pointless and energy draining if you aren’t gathering data on the impact of your action (= results) and if there is no purpose behind your action (= achievement). I’ve experienced a lot of people and organisations taking lots of action, and sometimes taking the same action over and over again, and not having any idea about the impact their action is having because they don’t track and measure their impact. Furthermore, their action starts to become meaningless because they have no objective or purpose so they can achieve. What are your thoughts: Action – Achievement = ??? I was recently introduced to strategist Chin-Ning Chu via a discussion forum on Linkedin on the topic of the shortage of authentic women leaders. After watching a 40 minute speech she gave in San Francisco to a group of women, I am so disappointed to find out she recently passed away and I had not known of her amazing work earlier. Yesterday I was watching Jill Bolte Taylor’s TED talk about her experience having a stroke. There is a moment when she described how she could feel herself losing connection to her left brain and being lost in the right side of her brain. When her left brain became silent, she suddenly felt euphoric, all of her ‘emotional baggage’ from the last 37 years disappeared, she felt bigger then herself, completed connected and part of everything around her. She called this ‘la la land’. This morning in cycling class I was reminded again of that feeling of being completely present and part of the moment you are experiencing, when you do not feel a separation between you and the bike; you are just one being. Another way I can describe my personal experience is having a moment when I felt so powerful and so much bigger than the individual that I am in my own body; and when I’ve felt that way I’ve had a hugely positive impact on others lives (so they’ve told me…).